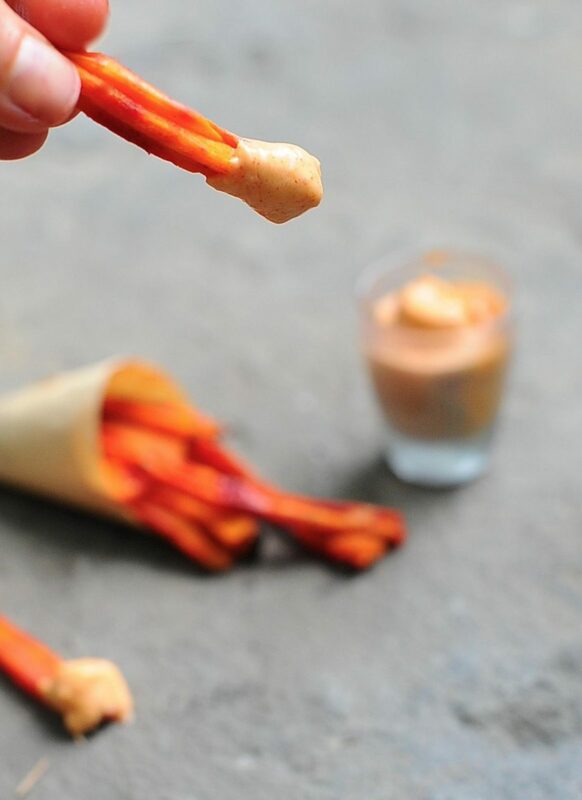 Thin cut carrots baked until they surrender to their innate sweetness, sprinkled with kosher salt and then dipped in a garlicky, chipotle aioli. “Dip. dip, dip, ummmmmmm” as she plunged the greasy, salty, ketchup coated fry into her tiny maw. Life is full of small ironies. One of my favorites is that my husband loves anything with chipotles yet can not for the life of him pronounce it correctly. This may have been exacerbated by a road trip we took six years ago with my son Aylam. Driving across the U.S. we stopped at a lot of Chipotle restaurants for their great veg options. The first time my husband mispronounced the word chipotle my son and I began a game of purposely mispronouncing it so my hubby could never quite get it right. A kind of verbal monkey in the middle with my hubby desperately grasping for the ball. 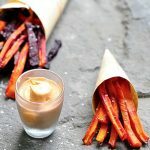 Hunter from Peanut Butter & Vegan was the incredible innovator who whipped up the first aquafaba mayo; much like Prometheus bringing fire to mankind. I based my aioli recipe on theirs oh so delicious one. All hail the Mayo bringers! 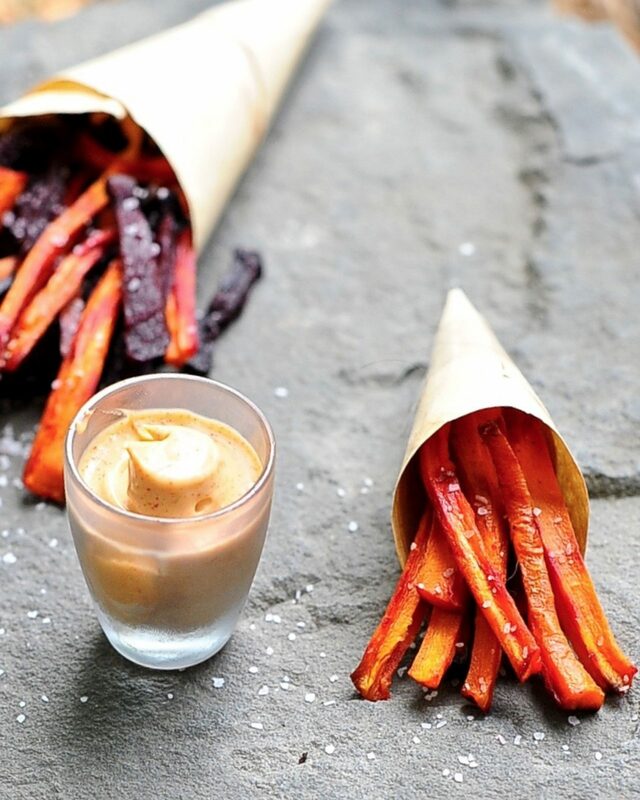 Sweet carrot spears served with creamy chipotle aioli. 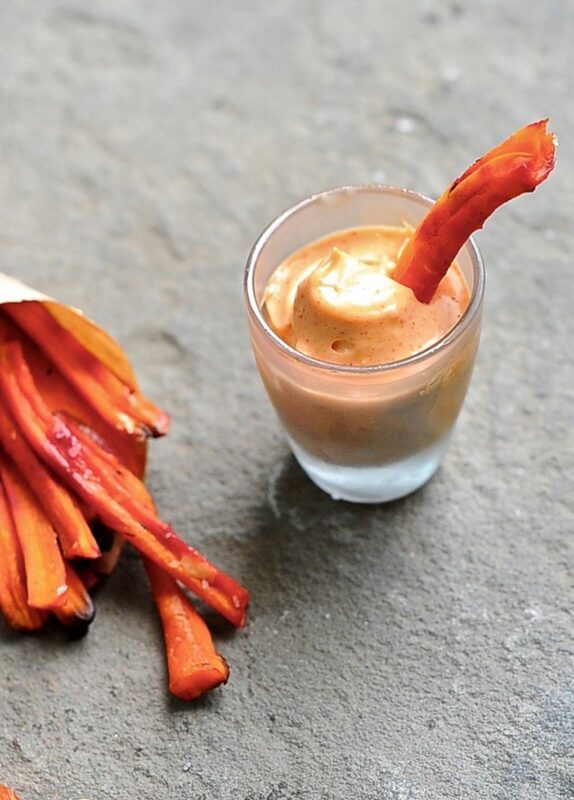 Sometimes I smear bread with this smokey aioli and make a roasted carrot sandwich. But then again I'm weird. Turn oven to 425 fahrenheit. 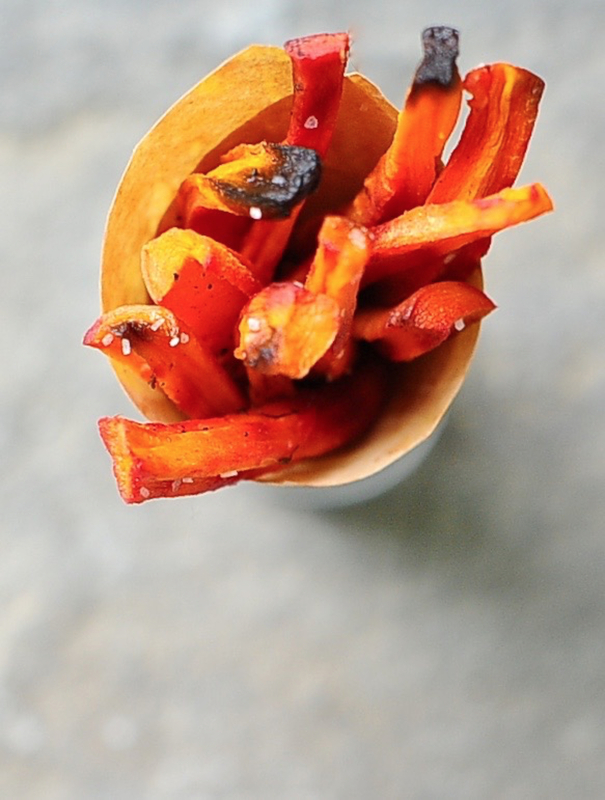 Cut your carrots into thinish french fry shapes, somewhere between shoe string and thick cut. Place you cut carrots into a baking pan with oil, garlic powder and smoked paprika (if using) and give them a good toss. It is important that you use a baking pan big enough for them to spend in one layer. Bake between 12 and 20 minutes. You want them to retain their structural integrity but soften and caramelize as well. 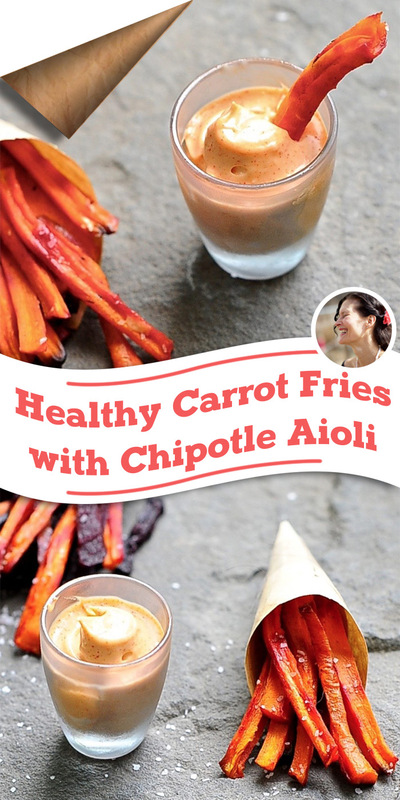 Remove from the oven and serve with Chipotle aioli. This has only ever worked for me with an immersion blender. Find a container that just fits the immersion blender. I use a drinking glass or pyrex measuring cup. Into your chosen container place the vinegar, mustard, salt, aquafaba and garlic. Whiz those ingredient together for about 10 seconds. Slowly drizzle in the oil with the blender still running. As you incorporate the oil your mixture will begin to thicken and you'll need to move the blender up and down in a wave like motion. Once the oil is incorported cover you container and allow it to thicken in the fridge for an hour.